Background: For over 2 decades, Ghana’s Ministry of Health (MOH) has been resolved to continuously improve the quality of healthcare in a cost-effective manner. Strategies have been adopted to enhance client satisfaction with healthcare services and delivery. Objective: The current study examined patient satisfaction with the quality of healthcare in Ghana by comparing healthcare services at the University of Ghana Hospital (UGH) and the University of Cape Coast Hospital (UCH). Methods: This cross-sectional study was conducted in 2014-2015 with primary data collected from patients at UGH and UCH. Structured questionnaires were administered based on the stratified and convenience sampling methods to select patients receiving healthcare at the outpatients departments of the 2 hospitals. Descriptive statistics and linear regression analysis were used to analyze the data with the help of SPSS version 20. Results: The findings indicated that empathy (β=0.14, P=0.003), communication (β=0.26, P=0.00), culture (β=0.17, P=0.008), tangibles (β=0.12, P=0.040), and priority (β=0.18, P=0.002) are significant predictors of patient satisfaction. Conclusion: Management at the 2 studied hospitals should streamline their quality healthcare policies based on the dimensions of effective communication, empathy, culture, tangibles, and priority to enhance patient satisfaction. World Health Organization. Patient safety research: a guide for developing training programmes. Geneva: WHO; 2012. Epstein A. Sounding board: the outcomes movement, will it get us where we want to go? N Engl J Med. 1990;323(4):266–269. doi:10.1056/NEJM199007263230410. Blumenfeld SN. Quality assurance in transition. Papua and N Guinea Med J. 1993;36(2):81-89. Turkson PK. Perceived quality of healthcare delivery in a rural district of Ghana. Ghana Med J. 2009;43(2):65-70. Aldana JM, Piechulek H, Al-Sabir A. Client satisfaction and quality of health care in rural Bangladesh. Bull World Health Organ. 2001;79(6):512-517. Vemula R, Assaf RR, Al-Assaf AF. Making patient safety and quality improvement act of 2005 work. J Healthc Qual. 2007;12(4):12-25. doi:10.1111/j.1945-1474.2007.tb00199.x. Sarpong N, Loag W, Fobil J, et al. National health insurance coverage and socio‐economic status in a rural district of Ghana. Trop Med Int Health. 2010;15(2):191-197. doi:10.1111/j.1365-3156.2009.02439.x. Turkson AH. Utilization of teaching space in Cape Coast Polytechnic. http://ir.ucc.edu.gh/handle/123456789/311?mode=full. Ghana. Statistical Service, Noguchi Memorial Institute for Medical Research, ORC Macro. MEASURE/DHS+ (Programme). Ghana demographic and health survey, 2003. Ghana Statistical Service; 2004. Aduo-Adjei KO. Patients Satisfaction with Quality Healthcare in Ghana: A Comparative Study between University of Ghana and University of Cape Coast Hospitals [dissertation]. Ghana: University of Ghana; 2015. Witter S, Adjei S, Armar-Klemesu M, Graham W. Providing free maternal health care: ten lessons from an evaluation of the national delivery exemption policy in Ghana. Glob Health Action. 2009;2. doi:10.3402/gha.v2i0.1881. Ayimbillah Atinga R, Abekah-Nkrumah G, Ameyaw Domfeh K. Managing healthcare quality in Ghana: a necessity of patient satisfaction. Int J Health Care Qual Assur. 2011;24(7):548-563. doi:10.1108/09526861111160580. Agyepong IA, Adjei S. Public social policy development and implementation: a case study of the Ghana National Health Insurance scheme. Health Policy Plann. 2008;23(2):150-160. Ministry of Health. Quality Healthcare Delivery Assessment Report. Accra: Ministry of Health; 2007. Essiam JO. 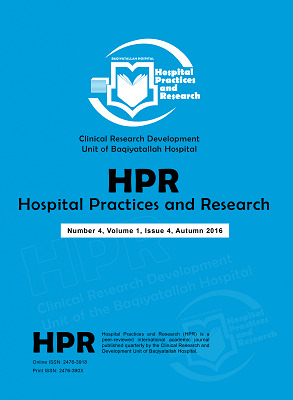 Service quality and patients satisfaction with healthcare delivery: empirical evidence from patients of the out patient department of a public university hospital in Ghana. Eur J Bus Manag. 2013;5(28):52-59. Pakdil F, Harwood TN. Patient satisfaction in a preoperative assessment clinic: an analysis using SERVQUAL dimensions. Total Quality Management & Business Excellence. 2005;16(1):15-30. Naidu A. Factors affecting patient satisfaction and healthcare quality. Int J Health Care Qual Assur. 2009;22(4):366-381. Drain M. Quality improvement in primary care and the importance of patient perceptions. J Ambul Care Manage. 2001;24(2):30-46. World Health Organization. Global status report on alcohol and health. Geneva: World Health Organization; 2014. Berry LL, Parasuraman A, Zeithaml VA. The service-quality puzzle. Bus Horiz. 1988;31(5):35-43. Dellande S, Gilly MC, Graham JL. Gaining compliance and losing weight: The role of the service provider in health care services. J Mark. 2004;68(3):78-91. Elbeck M. An approach to client satisfaction measurement as an attribute of health service quality. Health Care Manage Rev. 1987;12(3):47-52. Steiber SR. Preventing pitfalls in patient surveys. Health Care Strateg Manage. 1989;7(5):13-16. Scales J, Terry Jr R, Torres RM. Are Teachers ready to integrate science concepts into secondary agriculture programs? J Agric Educ. 2009;50(2):102-113. Tabachnick BG, Fidell LS, Osterlind SJ. Using multivariate statistics, 2001.